A leaking swimming pool can lead to abnormally high water bills and also cause other hitches that may hinder its usability and longevity. Besides, the process of inspecting, detecting and doing repairs on pool leaks can be quite cumbersome, especially if you are not well conversant with swimming pools. In order to easily avoid such unnecessary expenses and stress, simply talk to us (Swimming Pool Singapore) for professional swimming pool inspection, leak detection and repair. We have the best equipment and certified pool technicians to ensure that you continue enjoying swimming without any problems. Our company is well established with the right team of experienced and certified swimming pool experts and equipment to deliver professional and reliable inspection, leak detection and repair services for all kinds of residential and commercial swimming pools. Our services are readily available across Singapore so you can always get the ultimate solutions without any hassle. In fact, you should not wait to suspect or see a leak before calling us. We can do regular inspections to ensure that you continue using the pool without any worries. Read on to find out more on why we are the right partner to always look up to for ideal pool inspection, leak detection and repair works. Whether your pool has only one or a couple of leaks, the impacts can be devastating due to the wastage of water and inconvenience. In order to eliminate the problem once and for all, we do proper inspection of swimming pools. Through this, we are able to determine all the points of leak that needs to be addressed. Inspection is important because it can also help in unearthing even potential threats for immediate solution. Our professionals have experience in inspecting different kinds of swimming pools and can effectively do a satisfactory job. In conducting an inspection, we will clear all the pool of all unwanted materials and substances safely without causing any damage. Our inspection is very comprehensive and includes all the floors, walls and also equipment of the swimming pool. For pools with water loss sensors, we shall also inspect the devices to help with the analysis of water loss. In case you are planning to buy a new home or business property with a swimming pool, it is still important to contact us for inspection. This will help you in knowing the condition of the pool before purchase. There are common signs of leakages that you can watch in order to know if your pool is leaking. Signs like, excess water consumption and chemical usage, presence of air in the pool system and constant wet spots around the pool can be easily noticed. The bucket test is also another way of determining if your pool is leaking. However, there may be several other hidden cases that you may not be able to detect. By relying on us, you will not be bothered with checking the pool regularly or conducting all the procedures required for leak detection. We have the best tools and personnel to do all that to the best standards. In order to properly detect all leaks in swimming pools, we use the latest technologies and procedures, including, underwater microphones, in-pool diving among others. Our professionals are conversant with leak detection on all kinds of in-ground and above ground swimming pools. For in-ground pools, we go further to also conduct pressure testing and more enhanced underwater visualization for detection of hidden leakages. After proper inspection and leak detection, we conduct repairs to ensure that such problems are fixed. We understand that swimming pools are designed and constructed differently, hence, always give a specialized treatment that perfectly suits each. The benefit of relying on us is that we not only inspect and detect leaks in swimming pools but also have the right materials to use in doing repairs. This ensures that all our clients are able to get the perfect solutions in one place, which is quite cheaper and stress-free. Based on the magnitude of the leaks, we shall recommend and use the right materials and procedures to make sure that all of them are properly repaired. For underwater leaks, we have experienced divers with skills in doing repairs on such areas. 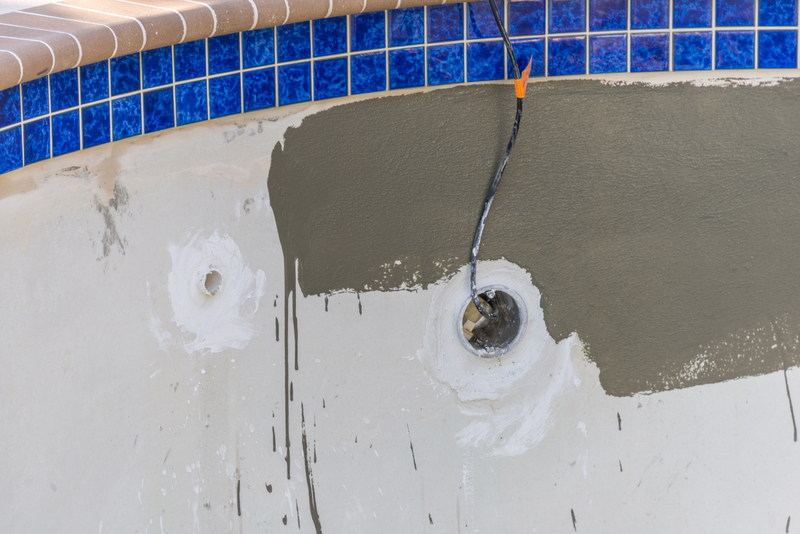 In case you own a concrete pool, we will also be able to patch up all the cracks and do proper finishing to close all the leaks. Our goal is to make sure that your pool does not experience leaks from all kinds of factors. We also fix problems in pool plumbing to eliminate all leaks. While doing repair works, there are some areas that may require replacements for the ultimate solutions. In such cases, we will see to it that your pool is accorded the right remedy against any future leaks. As soon as you talk to us for swimming pool inspection, leak detection and repair Singapore, you can proceed with your normal schedule as we take care of the pool. We always take pride in delivering the best services for all kinds of residential and commercial swimming pools. Since we have all the resources for detecting and fixing swimming pool leaks, you no longer have to run up and down looking for a solution. We can easily save you from all the hassles and unnecessary costs involved in finding a professional to inspect, detect leaks and repair your pool. Simply get in touch with us for the best swimming pool inspection, leak detection and repair Singapore.